In this groundbreaking alternative history of the most dominant ideology of our time, Milton Friedman's free-market economic revolution, Naomi Klein challenges the popular myth of this movement's peaceful global victory. From Chile in 1973 to Iraq today, Klein shows how Friedman and his followers have repeatedly harnessed terrible shocks and violence to implement their radical policies. As John Gray wrote in The Guardian, "There are very few books that really help us understand the present. 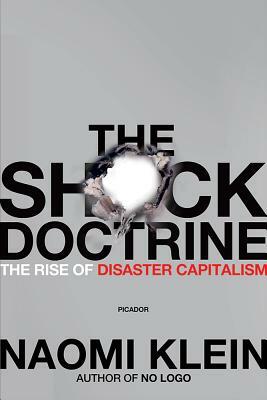 The Shock Doctrine is one of those books." Naomi Klein is the award-winning author of the acclaimed international bestsellers No Logo and The Shock Doctrine, both of which have been translated into more than 25 languages with over a million copies in print. The Shock Doctrine was a New York Times Critics’ Pick of the year, and The Literary Review of Canada named No Logo one of the hundred most important Canadian books ever published. She is also the author of the essay collection Fences and Windows. With Avi Lewis, she co-created the documentary film The Take, which was an Official Selection of the Venice Biennale and won the Best Documentary Jury Prize at the American Film Institute’s Film Festival in Los Angeles. She is a contributing editor for Harper’s, a reporter for Rolling Stone, and writes a regular, internationally syndicated column. She has won the James Aronson Award for Social Justice Journalism. She is a former Miliband Fellow at the London School of Economics and holds an honorary Doctor of Civil Laws from the University of King’s College, Nova Scotia. Born in Montreal, she now lives in Toronto.